R-2-C Clear PVC Med. Wt. Wire Reinforced Exhaust Hose - 6"
Home>Plumbing>Plastic Tubing>PVC Suction & Discharge Hose>Flexaust All-Plastic Wire Reinforced Hose>R-2-C Clear PVC Med. Wt. 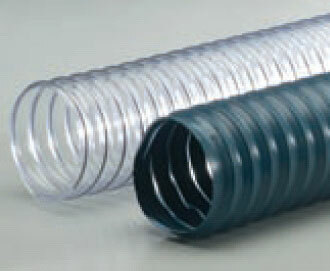 Wire Reinforced Exhaust Hose > R-2-C Clear PVC Med. Wt. Wire Reinforced Exhaust Hose - 6"
 Good for positive pressure and light vacuum applications.  Combines extreme flexibility with tight bending characteristics.  Made of medium-wall PVC, reinforced with spring steel wire helix.  Temperature range: 10ºF to 160ºF.  Standard length: 25 ft.
 Clear hose is FDA accepted.